During the period of October 2018 through September 2020, Maine credentials (driver's licenses and IDs) will be accepted as valid identification for federal purposes, such as entrance to federal facilities and boarding commercial aircraft. One document that establishes identity, date of birth, and proof of U.S. citizenship, lawful permanent residence, or temporary lawful status in the U.S.
Two documents to establish proof of residence in the State of Maine, such as a utility bill, paycheck stub or mortgage statement (P.O. Box is not acceptable). Those who have a valid license or ID will not be required to renew it prior to its expiration date, unless they choose to do so because they desire/need a Real ID credential. Upon renewal, you will have the option of getting a Real ID credential or opting out. Those who opt out will be issued a non-REAL ID license. Beginning Oct. 1, 2020, those with non-REAL ID licenses will need to produce a passport or other acceptable identity document for federal purposes that require identification, such as boarding commercial aircraft and accessing secure federal facilities. Details of the implementation process at BMV are under development at this time and we will make more information available as the launch date nears. The REAL ID Act, passed by Congress in 2005, requires changes to state standards, procedures and requirements for the issuance of driver's licenses and identification cards in order to be accepted as identity documents by the federal government. The REAL ID Act is a federal law passed by Congress that establishes minimum federal standards for state issued driver's licenses and identification cards to be accepted for certain federal purposes, like entering a federal building or boarding a domestic commercial flight. How long is Maine's current extension and what does that mean? Maine's current extension is until October 10, 2018 and continues to allow Maine issued driver's licenses and identifications cards to be used to enter secure federal facilities and board domestic commercial flights. What happens when the current extension expires? Maine expects to be granted another extension to allow the continued use of the current driver's licenses and identification cards while BMV is in process of updating its system to allow the ability to create REAL ID compliant driver's licenses and identification cards by July 1, 2019. What happens after October 1, 2020? Beginning October 1, 2020, you will need a REAL-ID compliant driver's license, identification card or an acceptable alternative form of identification as approved by TSA https://www.tsa.gov/travel/security-screening/identification, to board domestic commercial flights or enter a federal facility without a secondary form of Department of Homeland Security (DHS) approved identification. Can I board a plane with the driver's license or identification card I have now? Yes. Current Maine issued driver's licenses and identification cards will remain acceptable as identification for boarding domestic commercial flights as long as an extension is in place. Is a child required to have a REAL ID compliant driver's license or identification card when flying? TSA does not currently require a child under the age of 18 to have a REAL ID compliant driver's license or identification card when flying with an adult who has a REAL ID compliant driver's license or identification card. Why would I want a REAL ID compliant driver's license or identification card? Your REAL ID compliant driver's license or identification card, and other federally accepted forms of identification can be used to board a commercial flight or visit a secure federal building on or after October 1, 2020. Visit https://www.dhs.gov/real-id for more REAL ID information. Do I have to get a REAL ID compliant driver's license or identification card? What is the difference between a REAL ID compliant and a non-compliant driver's license or identification card? Appearance - A REAL ID compliant driver's license and identification card will be marked with a gold star symbol on the face of the card. A non-compliant driver's license or identification card will not have the gold star and will have text indicating that is cannot be used for Federal purposes. Usage - After October 1, 2020, a non-compliant driver's license or identification card will not be accepted for federal identification purposes such as domestic air travel or access to certain federal facilities. Will a non-REAL ID compliant driver's license or identification card be less secure? No. 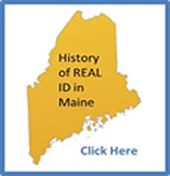 Maine BMV is committed to ensuring the security of all driver's licenses and identification cards whether they are REAL ID compliant or not. Can I have both a REAL ID compliant driver's license and identification card? No. REAL ID regulations specify that an individual can only have one REAL ID compliant credential - either a driver's license or identification card. When can I get a REAL ID compliant driver's license or identification card? REAL ID compliant driver's licenses and identification cards will be available beginning July 1, 2019. Where do I go to get a REAL ID compliant driver's license or identification card? When REAL ID compliant licenses and identification cards are available, your initial application for a REAL ID compliant driver's license or identification card must be done in person at a BMV branch office or mobile unit. You will not be able to use the online renewal service. What documents will I need to provide to obtain a REAL ID compliant driver's license or identification card? Proof of Social Security Number or evidence of Social Security Number ineligibility. Two documents to establish proof of residence in the State of Maine, such as a utility bill and mortgage statement (P.O. Box is not acceptable). Will copies of the documents provided be retained? Yes. The documents will be verified, scanned and the images retained. 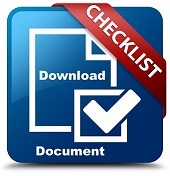 You will not need to provide these documents again unless changes are made to personal identifying information (e.g. name change due to marriage, divorce or change of social security number). How much will a REAL ID compliant driver's license or identification card cost? If the name on your proof of identity document is different than your current name, you must bring proof of that legal change. For example, a marriage certificate, divorce decree, naturalization certificate or U.S. Passport. What if I plan to travel to Canada by car? U.S. and Canadian ports of entry are aware of the State of Maine’s REAL I.D. waiver and will accept regular, valid Maine license and I.D. cards for identification purposes at the border, until Oct. 1, 2020. At that time, a regular Maine license or I.D. will no longer be accepted as a valid form of photo identification. Birth certificate with a valid, government-issued photo I.D. U.S. certification of citizenship with a photo I.D.